After a stunning upset at North Carolina on Sunday, Notre Dame administered a thorough beat down of Clemson — 101 to 63. 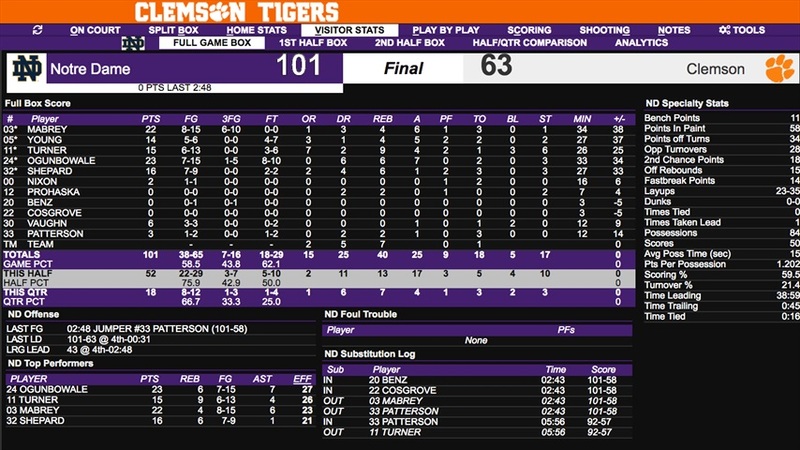 After the Tigers scored the game’s first basket, the Irish reeled off a 16-0 run to take control of the game. ND scored 32 first quarter points to lead by 14 at the end of one. "I was really pleased with the way we came out starting the game,” head coach Muffet McGraw said. "I really thought we were focused and looking for each other. I thought we passed the ball well. It was great to have Jackie Young back. She really changes things for us." Clemson closed the margin to seven (44-37) with just over two minutes to go until halftime. The Irish went on a 5-0 run to close the half and lead at the break 49 to 37. After the hot start, the Irish cooled off in the second quarter making just 6 of 17 shots. The cold shooting didn’t last long. Notre Dame started the third quarter on a 7-0 run on their way to outscoring Clemson 34-13 in the third. The Irish made 14 of 17 field goal attempts in the quarter (82.4%) and followed that up with an 8 for 12 effort in the final period with reserves playing most of the quarter. ND was 22 for 29 in the second half (75.9%) and 38 for 65 (58.5%) for the game. Marina Mabrey went 6 for 10 from three as the Irish made 7 of 16 overall. Clemson turned the ball over 28 times, and the Irish scored 34 points off the Tiger giveaways. 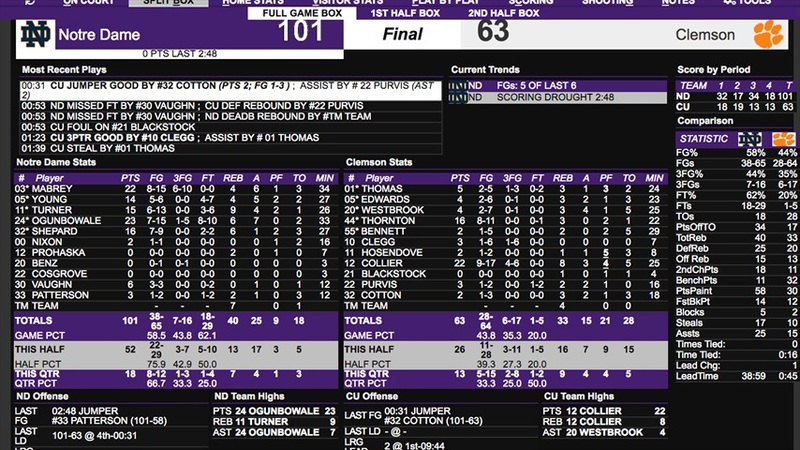 The Irish also had 58 points in the paint, while Clemson could only manage 30. Clemson did make 6 three-point baskets. They had averaged just three made threes a game, but senior guard Aliyah Collier went 4 for 6 beyond the arc. She had made just 7 three-point baskets all season. After turning the ball over 13 times in the first half, the Irish only had 2 in the third quarter and 3 in the fourth for a game total of 18. The Irish had a season-high 17 steals. ND won the rebounding battle 40 to 33 including 15 offensive rebounds. The Irish had 25 assists on the night. 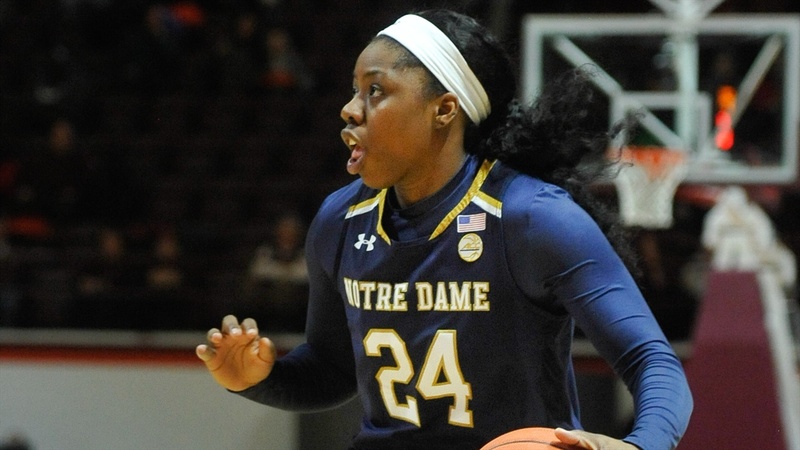 Arike Ogunbowale had 7 assists to lead the Irish, Mabrey had 6, and Jackie Young 5. After a slow start in the first half (11 points and 3 for 10 from the field), Ogunbowale went 4 for 5 from the field in the second half and scored 23 to lead all scorers. She was 8-10 from the line, and also had 6 rebounds and 3 steals. Mabrey added 22 points and Jessica Shepard scored 16 with 6 rebounds. Brianna Turner had 15 points, 9 rebounds, 4 assists, 6 steals, 3 blocks and only 1 turnover after committing 7 against UNC. Jackie Young returned to the lineup after sitting out the North Carolina game, and she scored 14 points — all in the first half. The only negative stat for the Irish came at the free throw line — they made just 18 of 29 (62.1%). This was the sixth time Notre Dame has topped 100 points so far this season. Clemson had been holding opponents to an average of 63.8 points per game. Collier led Clemson with 22 points. Kobi Thornton, the Tigers’ leading scorer on the season, was the only other double-figure scorer for the home team. She finished with 16. Clemson came into the game with a conference record of 5-2 and coming off a narrow three-point loss to still-unbeaten NC State last week. The Tigers are now 5-3 in the ACC and 14-7 overall. Notre Dame picked up win number 20 against two losses. The Irish stand at 7-1 in the conference, and are tied with Louisville in second place one game behind NC State. The Wolfpack moved their ACC record to 8-0 with a 59 to 50 win at Wake Forest. Louisville played out of conference Thursday evening and beat UConn 78 to 69 at the Yum Center. While it’s only UConn’s second loss of the season, it delivers a critical blow to the Huskies’ quest for a number one seed in the NCAA tournament. UConn was sitting at #7 in the RPI before tonight’s loss — ahead of them were Notre Dame (still at #1 despite Sunday’s loss), Baylor, Stanford, Oregon, Louisville and NC State. UConn only has an away game at Central Florida in conference and a home game against South Carolina of the SEC that would be considered quality wins over the rest of the regular season. And neither team is in the top ten of the RPI or the weekly polls. The Irish return home for a Noon game against Georgia Tech on Sunday. The Irish beat the Yellow Jackets by 21 in Atlanta on January 6th.